Some brush deck motors have been brought back to life using the same method of just turning the motor by hand. You may want to blow it out, then use electric parts cleaner, blow it out again, and then oil the bushings. I took the wheel module apart, figuring I had nothing to lose since it needed to be replaced anyway. I saw 2 wires disconnected, and soldered them back. Now all works perfectly again. Power off by pressing clean for a few seconds. Press and hold clean and dock while pressing spot 9 times gets into auto-advance mode. Press and hold clean and dock while pressing spot 12 times gets into manual-advance mode. Pressing dock in manual mode advances to the next test. Auto-advance Built-in-Test Hold CLEAN and DOCK and pulse SPOT 3 times. Manual-advance Built-in-Test Hold CLEAN and DOCK and pulse SPOT 6 times. Auto-advance Mobility Test Hold CLEAN and DOCK and pulse SPOT 9 times. Manual-advance Mobility Test Hold CLEAN and DOCK and pulse SPOT 12 times. Display + beep software date code Hold CLEAN and SPOT and pulse DOCK 6 times. So the bumber check is ok ?? So cliff sensors are ok ? after this, although I can step through the test, nothing seems to happen. no wheels turn / brushes turn. The site i found says press CLEAN to start these tests, is that correct ? It would seem that your Roomba passed test 2 (bumper) and test 3 (L&R side cliff) Here is a dump of the BIT data from my 535. It did have a defective wheel down sensor that you will notice in the test results. 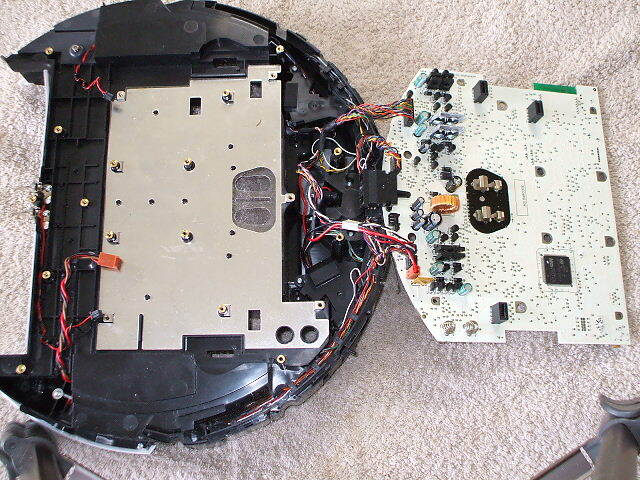 Labels: iRobot Roomba 560 Robotic Vacuum only goes in circle.